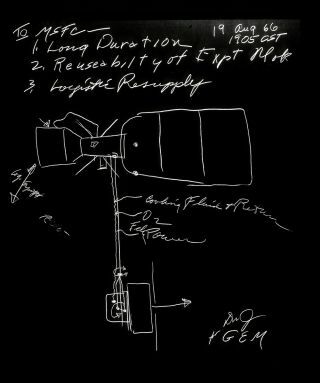 A sketch of Skylab, as drawn by George E. Mueller. In this historical photo from the U.S. space agency, a sketch of Skylab, as drawn by George E. Mueller, NASA associate administrator for Manned Space Flight, is pictured. This concept drawing was created at a meeting at the Marshall Space Flight Center on August 19, 1966. The image details the station's major elements. In 1970, the station became known as Skylab. Three manned Skylab missions (Skylab 2 in May 1973; Skylab 3 in July 1973; and Skylab 4 in November 1973) were flown on which experiments were conducted in: space science, earth resources, life sciences, space technology, and student projects.